No purchase necessary. Contests are open to all residents of British Columbia only, except employees of the sponsor(s) and its/ their subsidiaries and affiliates, advertising and promotional agencies and their immediate families. Entrants under the legal age of majority are eligible to win provided that the winning entrant's parent or legal guardian accepts the prize on his/her behalf. Correct answer to a skill-testing question required to win. Odds of winning depend on the number of eligible entries received. Winners must collect the prize in person and bring valid photo ID. One prize per winner. 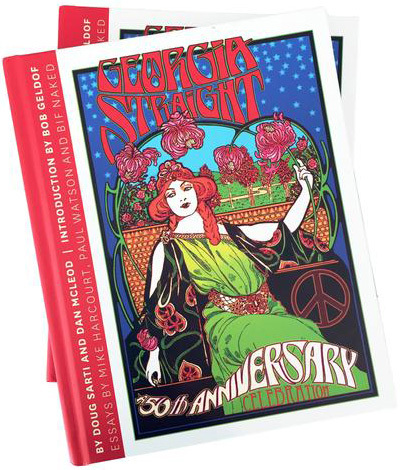 Georgia Straight contest winners during last 30 days are ineligible to enter. Winners will be notified within 5 business days of the drawing date. Winners names will be published once the contest closes. To be eligible for this Contest, an individual must: (i) be a legal resident of British Columbia, Canada; and (ii) have reached the age of majority in their province at the time of entry. The Contest is void where prohibited by law. The Contest begins when it is published on www.straight.com and closes at the deadline shown on the contest page (the "Entry Period"). To enter the Contest, fill out the on-line entry form. The submission of the on-line entry form constitutes an "Entry". There is a limit of one entry per person. If a contest has multiple draws, each draw will be selected from collected entries. Only one prize will be awarded per entrant during the entire period. Entries received online shall be deemed to be submitted by the holder of the email account. Multiple entries by the same person or from the same email address or from the same person from different email addresses in shall result in disqualification. All Entries must be submitted no later than the end of the Entry Period. All Entries become the property of Vancouver Free Press Publishing Corporation. Entries will only be accepted on-line. Illegible entries are ineligible. Unintelligible, incomplete, late or garbled Entries will be disqualified. Unless indicated, no Entries will be accepted by any other means, including but not limited to regular postal mail. a. A random draw from all eligible entries received will take place on or around the deadline shown on the contest page at Vancouver Free Press Publishing Corporation. Where applicable, the first name drawn is eligible to win the contest's Grand Prize. The subsequent names drawn will win the runner up prizes. Odds of winning are solely dependent upon the number of eligible entries received. The selected entrants may be required to correctly answer a skill-testing question prior to being deemed a winner and demonstrate that they have complied with all the Contest Rules. b. The entrant will be notified by phone or email and will be selected as the winner on a first answer basis. c. Neither Vancouver Free Press Publishing Corporation nor its affiliates will be responsible for the failure for any reason whatsoever of selected Entrants not being able to receive notification or for the selected Entrants not being able to respond as prescribed above. Before being declared a winner, the selected Entrant may be required to sign an agreement and release confirming compliance with the Contest Rules and acceptance of the prize as offered and (i) releasing the Vancouver Free Press Publishing Corporation and its respective subsidiaries, affiliates, employees directors, officers, suppliers, agents, sponsors and administrators from any and all liability for any loss, harm, damages, cost or expense arising out of participation in this Contest or participating in any prize-related activity or the acceptance, use or misuse of any prize, including without limitation costs injuries, losses and damages related to personal injuries, death, damage to, loss or destruction of property, rights of publicity or privacy, defamation, or portrayal in a false light, or from any and all claims of third parties arising therefrom. Such agreement and release must be returned within five (5) business days of the notification date indicated on the documents or the selected Entrant will be disqualified and the prize forfeited. a. Prizing is indicated on the online contest form. b. Prizes must be accepted as awarded and cannot be transferred, substituted or redeemed for cash. Vancouver Free Press Publishing Corporation or its affiliates reserve the right, in their sole discretion, to substitute any and all of the prizes for prizes of equal or greater value should all or part of a prize become unavailable for any reason. a. All entries become property of Vancouver Free Press Publishing Corporation upon receipt and will not be returned and no correspondence will be entered into except with selected Entrants. b. Any attempt to deliberately damage any website or to undermine the legitimate operation of this Contest is a violation of criminal and civil laws and, should such an attempt be made, Vancouver Free Press Publishing Corporation reserves the right to seek remedies and damages to the fullest extent permitted by law, including criminal prosecution. c. Entries are subject to verification and will be declared invalid if they are illegible, incomplete, mechanically reproduced, mutilated, forged, falsified, altered or tampered with in any way. (b) agrees to fully indemnify Vancouver Free Press Publishing Corporation and administrators and their respective directors, officers, employees, parent companies, subsidiaries, affiliates, suppliers, sponsors and agents from any and all claims by third parties without limitation. (d) acting in an unsportsmanlike or disruptive manner, or with intent to annoy, abuse, threaten or harass any other person. Vancouver Free Press Publishing Corporation and contest administrators assume no responsibility or liability for lost, late, delayed, misdirected or incomplete Entries, notifications, responses, replies, or any agreement and release documents or for any computer, online, telephone, hardware, software or technical malfunctions that may occur (including but not limited to malfunctions that may affect the transmission or non-transmission of an Entry). Vancouver Free Press Publishing Corporation and contest administrators are not responsible for any incorrect or inaccurate information, whether caused by website users or by any of the equipment or programming associated with or utilized in the contest or by any technical or human error which may occur in the processing of Entries in the contest. Vancouver Free Press Publishing Corporation assumes no responsibility for any error, omission, interruption, deletion, defect, delay in operation or transmission, communications line failure, theft or destruction or unauthorized access to, or alteration of, Entries. Vancouver Free Press Publishing Corporation is not responsible for any problems, failures or technical malfunction of any telephone network or lines, computer online systems, servers, providers, computer equipment, software, email, players, or browsers, on account of technical problems or traffic congestion on the Internet, at any website, or on account of any combination of the foregoing. Vancouver Free Press Publishing Corporation is not responsible for any injury or damage to Entrants or to any computer related to or resulting from participating or downloading materials in this contest. If, for any reason, the contest is not capable of running as planned, including infection by computer virus, bugs, tampering, unauthorized intervention, fraud, technical failures, or any other causes beyond the control of Vancouver Free Press Publishing Corporation which corrupt or affect the administration, security, fairness, integrity or proper conduct of this Contest, Vancouver Free Press Publishing Corporation reserves the right at their sole discretion to cancel, terminate, modify or suspend the Contest. In the event of a dispute regarding who submitted an Entry, the Entry will be deemed submitted by the authorized account holder of the e-mail address, submitted at the time of entry. "Authorized account holder" is defined as the natural person who is assigned to an e-mail address by an Internet access provider, online service provider or other organization that is responsible for assigning email addresses for the domain associated with the submitted e-mail address. Selected Entrants may be requested to provide Vancouver Free Press Publishing Corporation with proof that they are the authorized account holder of an e-mail address associated with the winning Entry. These are the official Contest Rules. This Contest is subject to all federal, provincial and municipal laws and regulations. These Contest Rules are subject to change without notice in order to comply with any applicable federal, provincial and municipal laws or the policy of any other entity having jurisdiction over Vancouver Free Press Publishing Corporation. Subject to the jurisdiction of the Régie des alcools, des courses et des jeux in Quebec, Vancouver Free Press Publishing Corporation reserve the right to amend or terminate all or any portion of this Contest at any time for any reason without prior notice.